Boeing 787 Dreamliner Is Safe, FAA Team Concludes : The Two-Way After a year-long review prompted by a battery fire and other problems, an FAA team has concluded that the jet meets its "intended safety level." 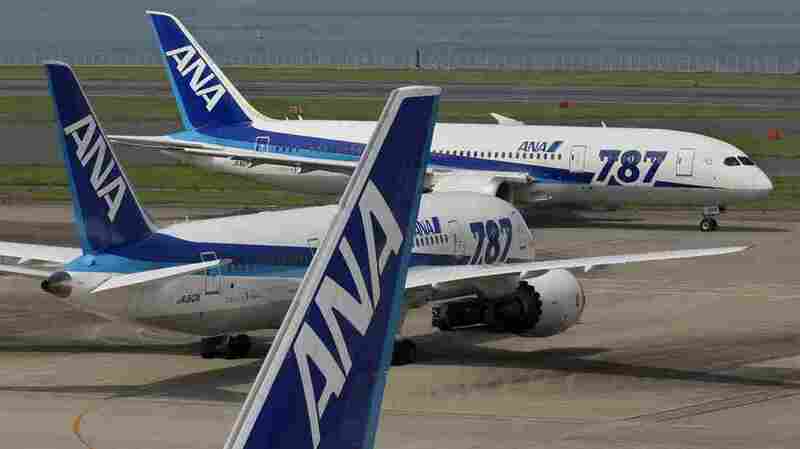 At Tokyo International Airport last July, Boeing 787 Dreamliners flown by All Nippon Airways taxied across the tarmac. A year-long review of the Boeing 787, which experienced problems such as fuel leaks and a battery fire, has concluded that the plane is safe. The Federal Aviation Administration reported Wednesday that a review team believes the aircraft, which Boeing calls the Dreamliner, "was soundly designed, met its intended safety level, and that the manufacturer and the FAA had effective processes in place to identify and correct issues that emerged before and after certification." "The review was initiated after a battery fire occurred aboard a 787 in January 2013 at Boston's Logan International Airport. The fire and another battery incident in Japan prompted regulators to ground the plane for 3 1/2 months last year. The plane has also suffered a series of mishaps with brakes, fuel lines, electrical panels, hydraulics, and other systems." The 787 was also grounded by the FAA for more than three months, "which led to a worldwide hiatus in flights for 49 planes," as USA Today says. "U.S. regulators and Boeing Co. didn't exercise enough quality control over subcontractors during the 787 Dreamliner's development, according to a review prompted by battery failures that led to the longest grounding of a commercial airplane since the 1950s. "The review found the Dreamliner is safe, meets design standards and is about as reliable as other Boeing jetliners were after being introduced. The Federal Aviation Administration issued seven recommendations, four for Boeing and three for itself, to improve the way new aircraft design and manufacturing is overseen." -- "Inspection delegation programs are not standardized and vary widely in approach throughout the industry." -- "Boeing should require its suppliers to follow industry standards for the training, qualification, and certification of supplier personnel performing Boeing-required (non-FAA) inspections." "The 787, Boeing's newest and most technologically advanced plane, is the first airliner to make extensive use of lithium-ion batteries. Since the FAA didn't have safety regulations for those batteries as installed equipment in planes when the 787 was designed, the agency and Boeing jointly developed the special safety conditions the plane's battery system should meet. "After the battery failures, the FAA was criticized for relying too heavily on designated Boeing employees to ensure the safety of the plane's design and manufacture. A National Transportation Safety Board investigation into the battery fire in Boston is still underway. Wednesday's report was not intended to address the battery's design, but rather the overall safety of Boeing's design and manufacture of the plane and the adequacy of FAA's oversight." The plane's batteries were redesigned after the overheating problem surfaced. The changes included adding insulation and a new steel box designed to contain any fire. According to Boeing, the Dreamliner can be configured to carry up to 290 passengers. It has a range of more than 9,200 miles.